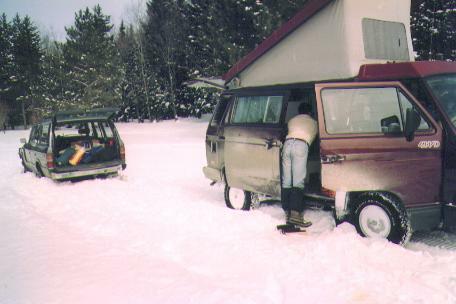 Here are a few pictures my '87 and '90 Westfalia Syncros in action. My email is derekdrew@rcn.com. If you are here for information more than pictures, scroll to the bottom of this Web page for links and other text info. 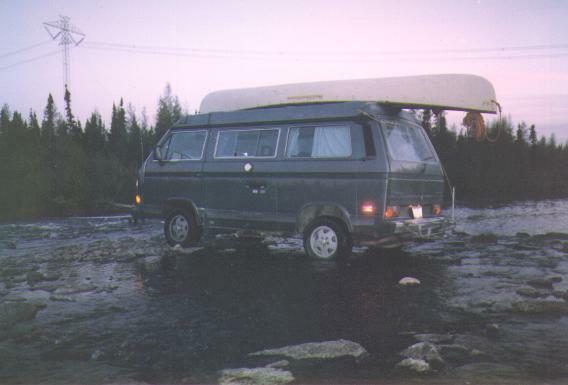 The van crosses a stream on a canoe expedition to Hudson Bay. 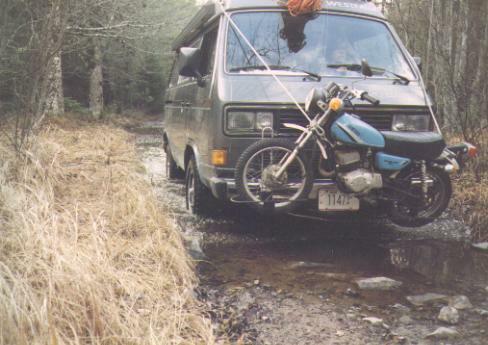 On a canoe expedition to Nova Scotia the van must travel a watery road. Another motorcycle is attached at the rear. Note the awning on the side. 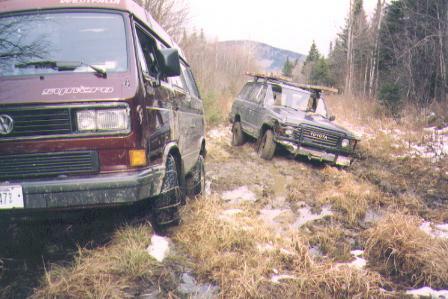 Despite chains, the van is stuck on a muddy abandoned logging road in Vermont. 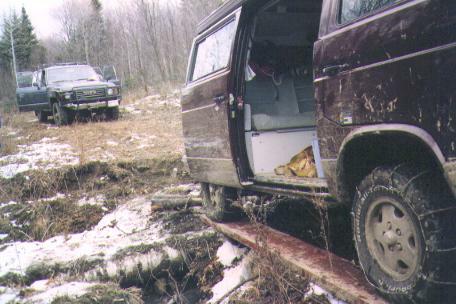 On a muddy road in Vermont, the van simply sinks in. 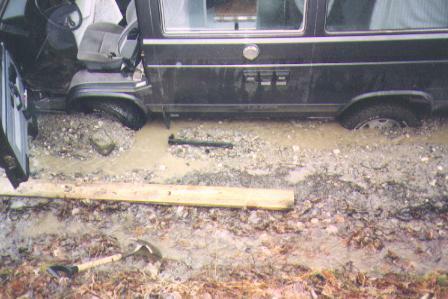 A high lift jack works better than this little dippy factory jack. 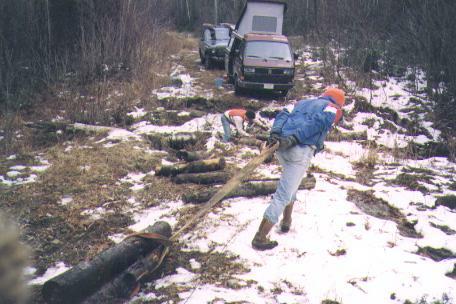 When the snowmobile trail gets too steep, we have to winch. Snow depth here is about 24 inches. 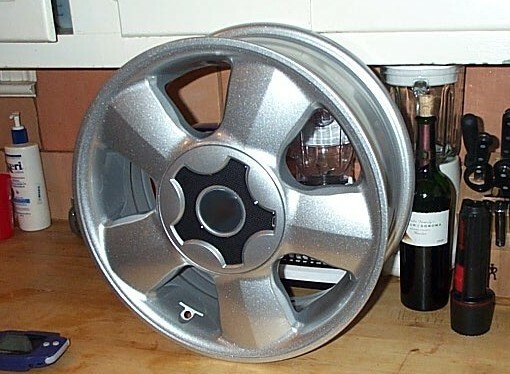 Tires are inflated to 14 psi. 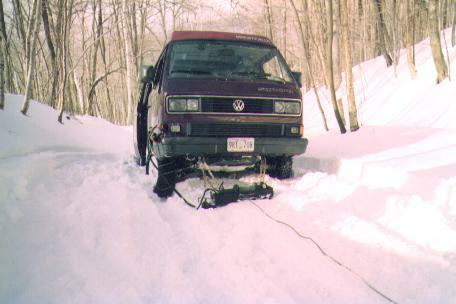 Note the snow chains. Note also the Oettinger fog lamps. Making hot chocolate on the trail. It is minus 5 degrees F here. 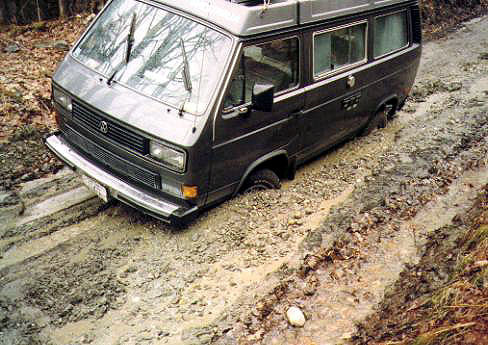 This 15 mile road was so bad it took us two days to drive it. 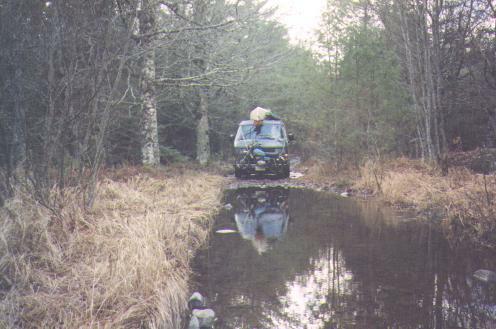 One of the reasons the road took us so long was we had to build a bridge. These boards we keep on the roof for bridge building purposes; when things get bad we take them down and drive on them. 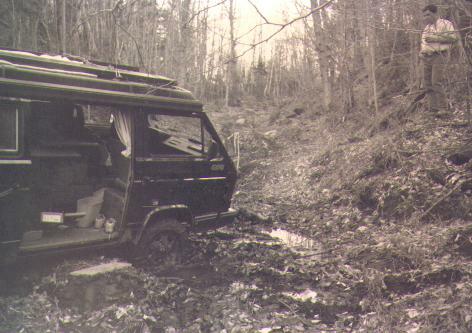 got the plug pulled on his VW van web site after his ISP went down. For my syncro list postings consolidated visit the following two links. (To get them all you have to do both because I switched phone numbers midstream). its next rebuild. Start planning for higher number ring and pinion sets NOW!